Purple leaf plum trees are delightful additions to your home orchard. This little tree, also known as cherry plum, offers blossoms and fruit in cool to moderate climates. 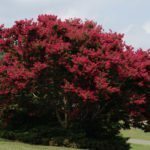 What is a purple leaf plum tree? 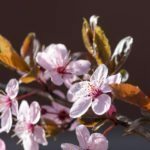 If you want more information on these trees and tips on how to grow a purple leaf plum, read on. What is a Purple Leaf Plum? Purple leaf plum trees (Prunus cerasifera) are small deciduous trees. Their habit is either erect or spreading. The slender branches fill with fragrant, showy flowers in springtime. The pale pink flowers develop into purple drupes in summer. These fruit are appreciated by wild birds and are also edible for humans. The bark is quite ornamental as well. It is dark brown and fissured. Purple leaf plums fit nicely into many backyards. They only grow 15-25 feet (4.6-7.6 m.) high and 15-20 feet (4.6-6 m.) wide. If you want to start growing purple leaf plum trees, you’ll need some basic information. The first step is to check your hardiness zone. Purple leaf plum trees thrive in U.S. Department of Agriculture plant hardiness zones 5 through 8. You’ll want to select a planting site that gets full sun and is easiest in well-draining soil. Be sure that the soil is acidic rather than alkaline. Purple leaf plum care won’t take much of your time as a gardener. These trees require regular irrigation, particularly during the season after planting. But even when they are mature, they prefer moist soil. Seek treatment at your local garden store. 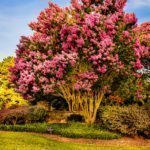 Even if you offer the best care to your trees, they will prove short lived. Purple leaf plum trees rarely have a lifespan longer than 20 years. You can select from a number of cultivars if you are seeking a particular effect. ‘Atropurpurea’ was developed in 1880, offering reddish-purple foliage and light pink blooms. ‘Thundercloud’ is the most popular cultivar and has been used excessively in many landscaped. It is relatively small, with deep purple leaves and blossoms that appear before the leaves. For a slightly taller tree, try ‘Krauter Vesuvius’. Its habit is distinctly upright. ‘Newport’ is the most cold-hardy selection. It forms a small, rounded tree with early blossoms.